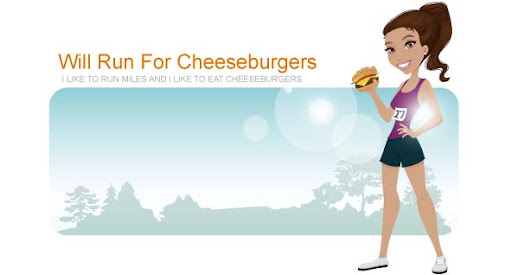 Will Run for Cheeseburgers: how close is too close? when I lived in Florida there was a small window of time where I felt it was acceptable to run outdoors ... usually it was "too hot" or "too rainy." aside from the random snow days, Charlotte has proved to be a city where I can run more often than not outdoors. unless it's super hot and humid, in which case I move into the indoor track ... such as today. I'm not exactly sure when it happened, but the treadmill and I had a falling out and I haven't been a fan of it in a long time. when indoors I choose to run 12 laps to equal 1 mile while at Harris YMCA. today I ran 48 laps and walked 3 laps, for a total of 4.25 miles. now don't get me wrong, I usually am in the zone and hate to be slowed down by the occasional walker in my lane. but I have NEVER purposely cut so close to someone where I actually touched them. she finished one more lap after that and then walked off. glad her work out was short and sweet so I didn't have to worry about any more nudges. also for the first time since I've been a gym goer I left my shirt somewhere at the YMCA. I had brought a tshirt to change into after my run so I wouldn't be a huge sweaty mess at my friend Steph's house and somehow just left my sweaty running tank lying around. fingers crossed someone turns it into lost and found. seriously who does that?